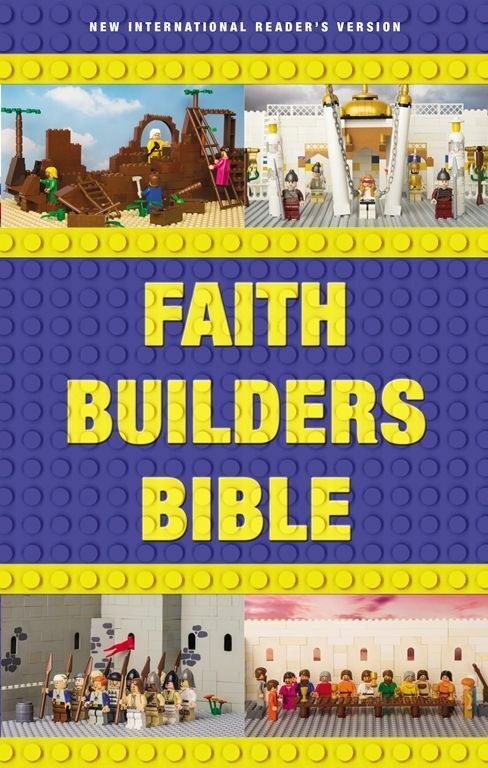 Zonderkidz provided me the really neat Faith Builders Bible to review. This book is fitting for kids that are 6 to 9 years of age. This is a hardcover book written in NIrV. NIrV is New International Reader's Version of the Bible which is a bit more simplified version of the normal NIV. Seems as though they took the NIV and shortened sentances and used easier words. About on the same grave level as kids in the age range would normally read. The font is a bigger size for easier reading for the kids. There are twenty four full colored pages of illustrations. 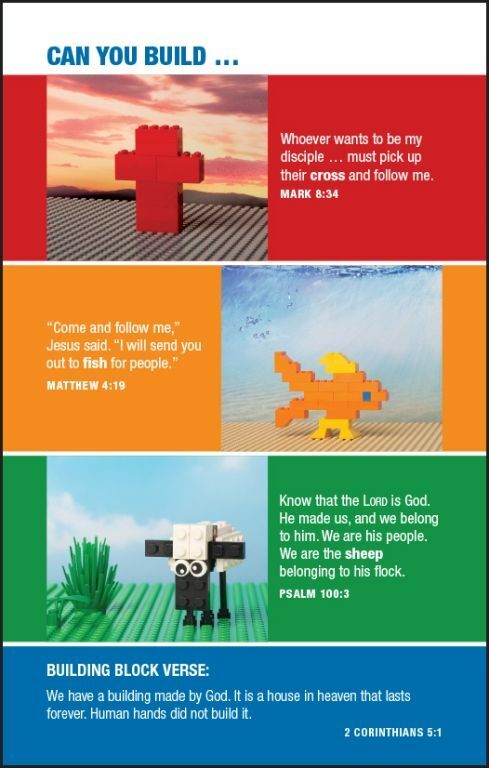 These pages use lego blocks and characters to teach about Bible stories. It also includes memory verses for them to learn. These pages are placed where the Bible stories are. You can also have some legos, or other building bricks (they are not affiliated with Lego brand) to recreate the stories. I have three kids who I let use the Bible. They are 7, 9, and 11. They all really enjoy legos and just recently got into them. I thought this was a great time to have the Bible to join in them while they were in the craze. I let them each look through the Bible, it was no doubt that the fun colorful pages stopped them and peeked their intrest. They wanted to read the stories right away. Since we still new to the lego world we do not have a ton, or any people, but the kids did try to recreate some of the versus. They were able to make the cross, fish, and lamb shown in this sample page. Allowing them something to do while I read to them helped them focus more on the meaning behind the stories. Once they made them we set them on the counter to help remind us to practice versus. We really enjoyed the Bible over all. The only thing I think would make it better was some more illustrated papers. I know my 7yo boy loved them but it was hard to get him to explore the rest of the Bible and be able to focus on what the versus were meaning. Or just maybe make the pages of the Bible bolder and add some colors. Even some silhouette bricks behind the words. I'm sure many Christians would enjoy this Bible for their child. Though maybe having other versions as an option would peak more intrest as well. I enjoy the simplistic writing of this version but some may want to have their version handy so kids can see how it was originally written and use this version as a conversation version to explain the meaning in a better way. The cover is also very inviting and neat to bring in the kids attention to it. Be sure to check them out on social media sites. Also see what my fellow crew mates had to say about the Bible.